One of the banners carried in the Liberation Day Ceremony, Lucca. When I visit Europe I am always reminded of the deep and lasting effects of the Second World War. From hedgerows in France, to the bombed cities of England, Italy, and Germany, the landscape here still echoes of a war that ended 72 years ago. Somehow, war feels closer here. One important benefit of travel is learning about the history, causes, and effects of conflicts, as well as standing in places touched by war. I feel fortunate to have visited war-damaged cathedrals in London, the American Cemetery in Normandy (where I searched for the name of my father's childhood friend, killed on D-Day), the outstanding Peace Museum in Caen, the Anne Frank House in Amsterdam, and the site of the Nuremberg trials. All were emotional experiences; all taught me something. Because I love Italy, I'm especially interested in the Italian war experience. In Pienza, I've visited an Etruscan cave, later a hermitage, and later still a hideout for the partigiani (Italian partisans or resistance fighters). 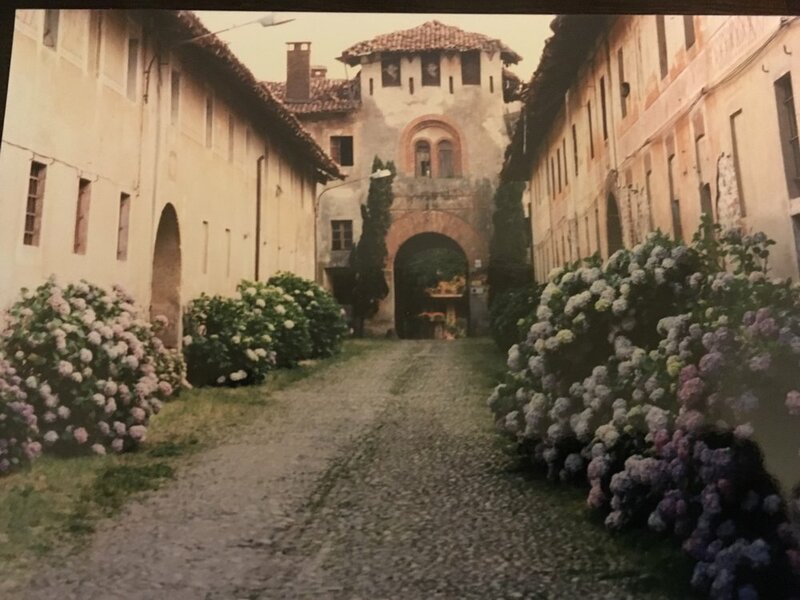 Twenty years ago I stumbled across a still war-damaged building in a small village near Milan, overgrown with the most beautiful hydrangeas. I was moved by Iris Origo's diary War in the Val D'Orcia and a visit to La Foce, where she lived during the war. I've walked along the river Serchio, of strategic importance during the war. I was horrified to learn aboug the massacre at Sant'Anna Stazzema near the end of the war, and pleased to know the story of the American Buffalo soldiers who participated in the Liberation of Lucca. I've been inspired by accounts of the partigiani and their role in fighting for, and liberating, the country they loved. These are fascinating and important pieces of the story of WWII in Italy. Though I've absorbed these experiences, the war is not my story - it belongs to the people here who lived it or have lived in its aftermath. To them it is both history and a part of daily culture. Ceremony honoring the liberation of Bologna. This year I was able to experience the Liberation Day celebration twice. First, in Bologna where a ceremony takes place on April 21, the day the partigiani liberated the city, and again in Lucca on April 25, the national holiday. Both cities had moving ceremonies, of remembrance and celebration. In Lucca there was a procession with representation from military, civilian, and civic groups; there were school children waving Italian flags, a band, speeches, and a solemn wreath laying ceremony. Children gather in Piazza San Michele, Lucca, for the Liberation Day ceremony.